In the mid-18th century, the art of fencing was in the process of evolving from a personal survival tactic in which a man went armed at all times, prepared to defend his honor and purse, toward the status of a gentleman's sport, a recreation with an emphasis on good form, posture, grace and agility. While the edged weapon remained throughout the century the mark of a gentleman and the weapon of a military officer, skill in fencing, like skill at dancing, had become a necessary social skill for all who would be considered gentlemen. My daughter fences, and her passion for the sport is very much connected to her interest in reenacting. 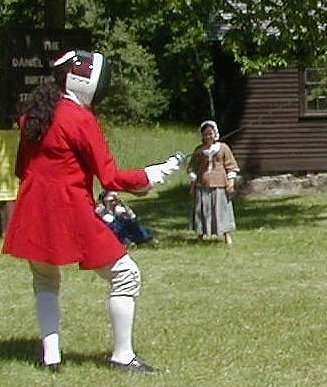 She had her very first taste of fencing in a lesson from Don Keleher at the Daniel Webster Birthplace Militia Muster in July 2002. It was love at first-'smite'? She fought her first competitive bout at a Jacobite event, the "Clash of the Tartans", that fall, and came in second, even though she had had only three lessons by then! It was clear that she would want to fence at reenactments. After all, her best reenacting buddy is a crack black-powder shot, a girl who often fields as a boy. 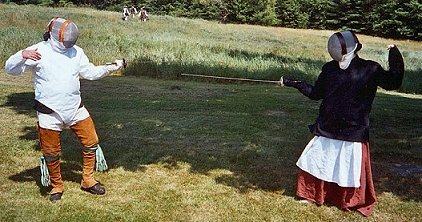 The little evidence which exists for 18th century women fencing suggests that they wore regular female clothing. However, she found that in the bouts at the Jacobite event, she was at a disadvantage in petticoats, so we agreed she needed an 18th century boy's fencing outfit. There was no question of trying to pass her off as a boy; she merely wanted an 18th century boy's outfit suitable for fencing, and one in which she liked the way she looked. 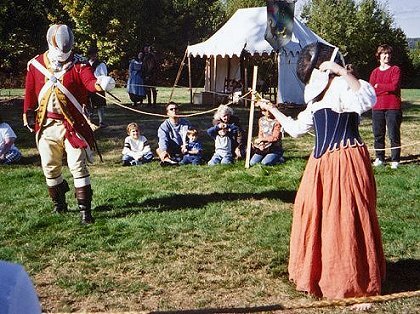 A brief survey of the 'net in the fall of 2002 revealed that codified rules for reenactment fencing garb exist in the SCA/Renaissance hobby but are not yet widespread in 18th century reenacting circles. The guidelines for an SCA - approved fencing-safe Renaissance doublet gave me some idea of what would constitute adequate protection. 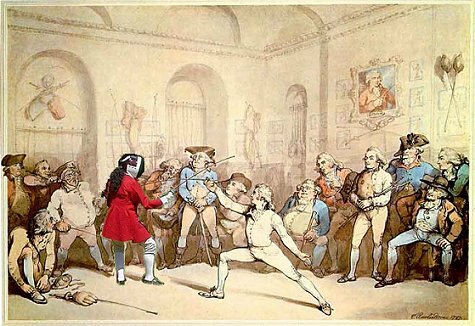 Period illustrations of 18th century fencing academies show that while the fencing mask was just coming into use in the third quarter of the 18th century, fencers otherwise apparently wore ordinary breeches and sleeved waistcoats. So I sketched out my thoughts for daughter's approval. She'd need a pair of flat-heeled period shoes, which she needed anyway, stockings, shirt, breeches and a sleeved waistcoat designed specifically to meet the needs of a fencer. Fortunately for us, suitable stockings, breeches and shirt were already in my collection of "loaner" clothing. The breeches, made by James Townsend & Son, were unbleached cotton canvas, fall-front, with a nice wide double-thickness of canvas, the lining of the front fall, covering the entire abdomen and groin. The shirt had come from the Tidy's Storehouse, back when Ken and Dianne were still sutlering. We chose a pair of men's shoes from Burnley & Trowbridge, as they seemed the most supple and flexible of the brands of re-enactor men's shoes available. Smoke & Fire provided an attractive, inexpensive pair of leather gauntlet-gloves to protect her wrists. All I needed to make was a suitably reinforced sleeved waistcoat. 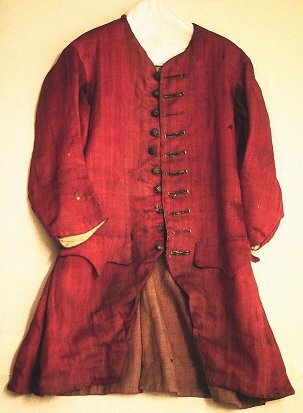 I opted for a c. 1750 waistcoat style, for several reasons. First of all, at mid-century, men's waistcoats were longer and less cut-away below the waist than they became as the century wore on, so the earlier style would cover more of her torso, thus providing better protection. 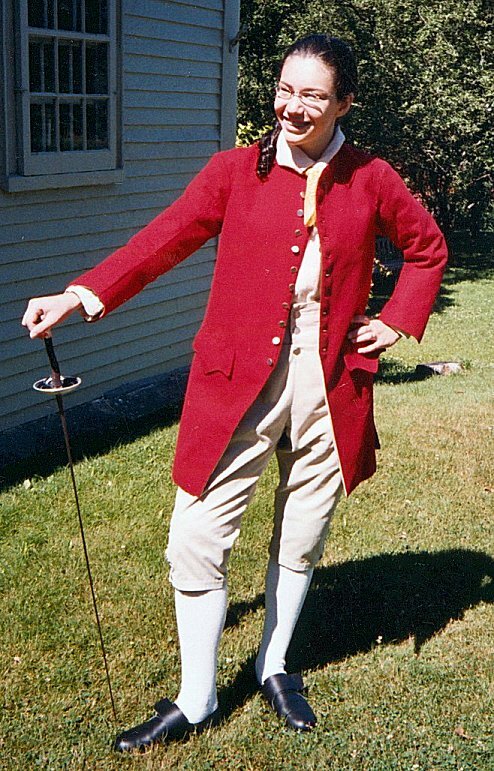 Second, my daughter goes to F&I events as well as RevWar, and the earlier style would be passable at either. 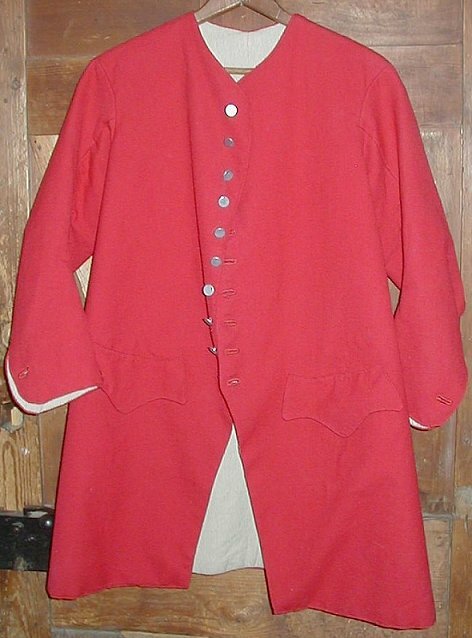 And lastly, I had the perfect prototype garment in mind, a c. 1750 youth's or small man's sleeved waistcoat in the collection of the Society for the Preservation of New England Antiquities. Eighteenth century fencers don't appear to have worn waistcoats especially designed for fencing. My intention was to make a garment that would look like an ordinary mid 18th century sleeved waistcoat, but would be invisibly reinforced to meet todays higher standards of safety. 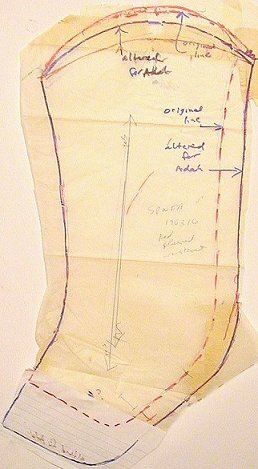 I scaled up the cutting diagram of the original and was happy to discover that it was just about my daughter's size in every dimension except girth. 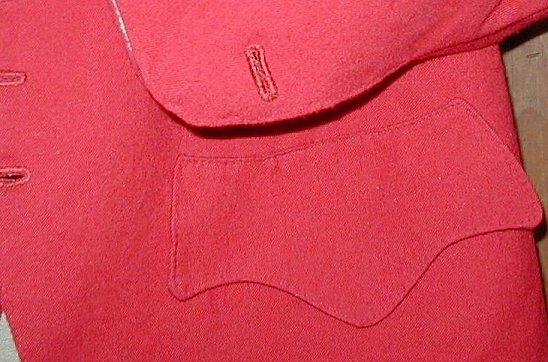 The original garment was made of a cherry red satin-weave worsted. A shopping trip with Sue Felshin to the Fabric Place in Woburn MA yielded what seemed like a perfect fabric for its replication, a cherry red twill weave worsted suiting. It fulled just a little in washing, but retained a lovely, soft hand, and I started to contemplate what combination of lining and interlining would provide the protective layers. 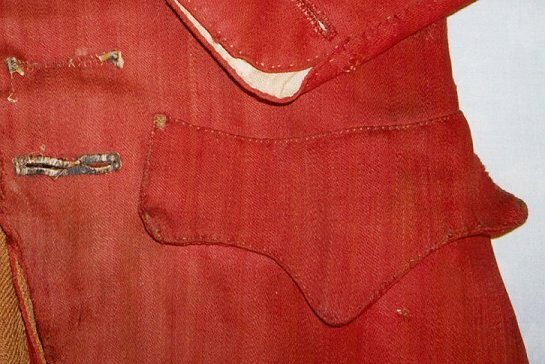 The original waistcoat had a lining pieced of natural linen, coarse red wool, and light brown worsted. 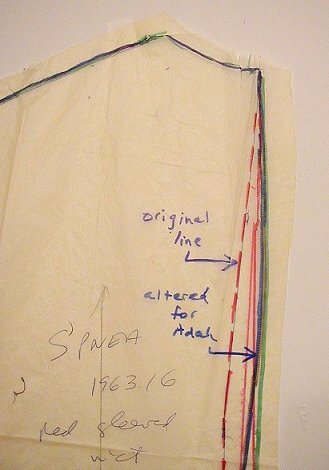 However I decided that, to simplify the project and to reduce bulk, I would line the replica in solid linen, and not make a pieced lining such as the prototype had had. I found in my stash enough tan linen-cotton blend to provide the lining, so the choice of interlining was the only decision yet to be made. 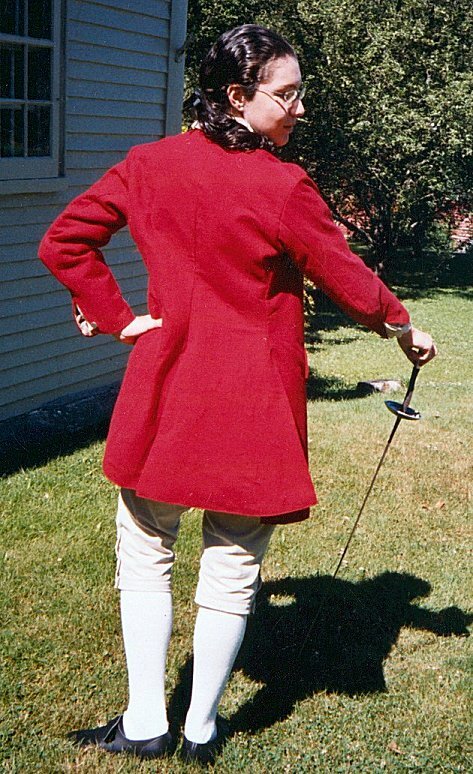 A fencing jacket, for any period, has to be a compromise between protecting the wearer and still maximizing mobility. Too thick or too stiff means the loss of agility, while too thin compromises safety. Also, the cut has to be sufficiently ample to allow ease in range of motion, but devoid of superfluous bulk. I had already come to the realization that the rigors of hand-sewing through many heavy layers of fabric was going to make this into a Heroic Project, and so I had already decided that a combination of machine sewing and iron-on fusible bonding, like Stitch-Witchery, was a necessary compromise if I was to finish the waistcoat in anything like a realistic time frame. After much debate, my daughter and I settled on cotton drill as the best choice for an interlining, but we remained undecided as to how many layers of it she would need. I cut some good-sized swatches and took them to Chris Pullo, the director of Seacoast Fencing Club in Manchester NH, where she trains. His opinion was that the lovely soft red twill worsted was too soft, and that a foil-tip, especially a broken one, might catch in the twill weave and create a hazard. He was emphatic that I would have to fuse the worsted twill to a layer of interfacing to stabilize the weave for safety. So my original ambivalence about using a non-period fusible bonding material like Stitch-Witchery gave way to the superior wisdom of the fencing master. I would have to fuse the red worsted to an interlining layer whether it was 'period correct' or not. Having established approximately how much thickness needed to be accommodated within the jacket's construction, I could begin to think about how to make it fit her optimally. In adjusting the original pattern for her needs, I found that the high, tight armscye needed little alteration. Although it seems counterintuitive, a tighter armscye fits closer into the wearer's armpit, thus actually allowing the best range of motion. I brought up the neckline a little, to sit closer to her throat, where it would be overlapped by her fencing mask. Original line in red, alteration line in blue. My daughter is 5'7", and wears a modern misses' size 8. Nevertheless, the original garment was just about right for her in sleeve length, torso length and skirts-length, but lacked about 4" in chest size and 8" in waist size to look and fit right. I can only assume it was worn by a scrawny guy! I added the extra amount at each side seam, splitting the difference between the front side seam and the back side seam, to as to preserve the relative position of the seams on the body. This ended up making the armscye circumference about an inch bigger, but the sleeves were too narrow by that amount anyway, so I made the whole sleeve pattern 1" wider, prepared to fiddle with this tricky part of the garment if necessary. Happily, the fit proved to need no reworking of the revised armscye. The original garment had been shortened at least 1" at the cuffs and at the bottom edges, so I added that back. I then added another inch to the sleeve length to better protect her forearms. I might have wanted to add more, but that would have forfeited the correct proportions of a mid-eighteenth century jacket. Then I cut out my revised pattern and made it up in muslin. I made my daughter put on all the underpinnings-sports bra, bust-protector cups, armpit-guard, shirt and breeches, to begin the fitting process. At this point it was clear that she needed still another nearly 2" of girth, which I added by moving over the center front edges by 7/8" on each side. I then cut a new 'muslin', only this time in the drill, which has more of the drape and 'hand' that the final waistcoat would have. For each stage of the fitting process, I made my daughter put on all the underpinnings and, wearing the test-garment, go through a set of extreme-reach fencing moves, to be sure she had just enough room where she'd need it, but no extra bulk. After some tweaking of the shoulder seams and sleeve heads, I felt ready to commence the finished product. All this fitting and refitting paid off, not only in fine-tuning the fit, but also in providing me with a ready-made interlining. I now had a complete set of waistcoat pieces in muslin and another in drill. Factoring in the bulk and stiffness provided by the Stitch-Witchery itself, my daughter and I had decided that one layer of drill, bonded to the sleeves and backs, would be sufficient, while the drill plus an additional layer of muslin, bonded to the fronts, would provide the extra protection needed there. I had only to undo the seams of the drill test-garment, salvage the fronts of the first muslin, and correct their seam lines a little. Presto, they became the interlinings. Unnecessary bulk in the seam allowance is never desirable, particularly in a snug two-piece sleeve. 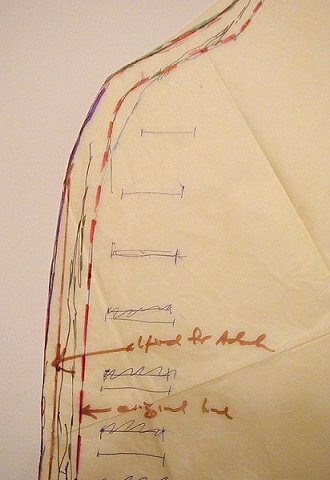 I cut away the seam allowances on both the muslin and the drill layers, leaving just 1/8" outside the seam lines, so that the interlining would be caught into the seams. I then cut each piece in Stitch-Witchery. A rotary cutter and large cutting mat made this part of the job easy! The difficult part was remembering what got fused to which side of which piece. 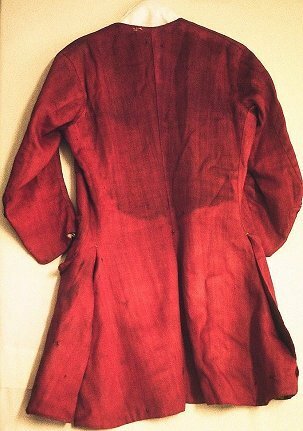 The drill was to be fused to the red worsted on the back and sleeves, but to the lining-fronts, so that the muslin layer could be fused to the red worsted fronts. I pinned everything and thought twice before beginning to fuse. Following the fusing instructions, I steamed the layers together, using a cotton pressing cloth, pressing over and over, testing the edges to see that the Stitch-Witchery had melted as per the directions, and turning each piece over at intervals to be sure no creases marred the bond. I realized very soon that any extra Stitch-Witchery adhered to the pressing cloth, so the pressing cloths had to be disposable, and replaced as often as the buildup of bonding material threatened to mar the final product. I used up the rest of the original muslin test-garment for pressing-cloths. Even so, I ended up with a few places on the red worsted where the bonding material adhered where I didn't want it, and it had to be carefully steamed off or picked off. It also became apparent that while the muslin-worsted combination fused relatively well, no amount of steam and pressure from my iron and ironing board was going to keep the drill from unsticking itself into little bubbles of unbonded fabric here and there. When I steamed one bubble away, another appeared. The problem had not manifested itself on my test-swatches, and by the time it appeared, it was too late to do much about it. If I had this project to do over, I might look further for a better product than the Stitch-Witchery. As it was, I told myself that my daughter wouldn't stand still in this jacket long enough for anyone to notice! Once the layers were all fused to the best of my ability and thoroughly cool and dry, I inserted the pockets. 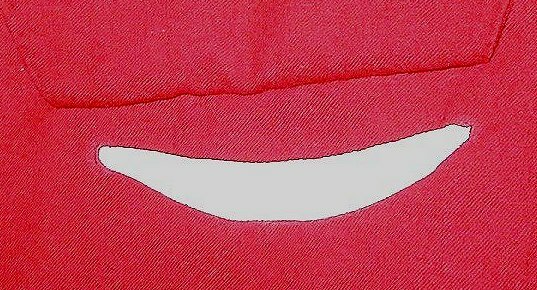 I cut out the "smile" leaving a 1/4 inch seam allowance and pressed that to the wrong side of the coat fronts. I used a cooler iron temperature so as not to unfuse the bonded layers. 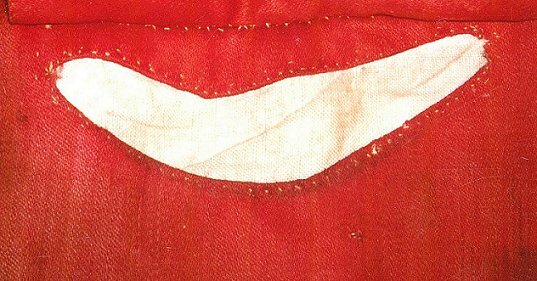 With the coat fronts facing right side up, the pockets were placed underneath, pinned securely, and their raw edges turned under to meet the edges of the "smile". I handsewed the pockets in place with a whipstitch, then made up and attached the pocket flaps with hand topstitching. 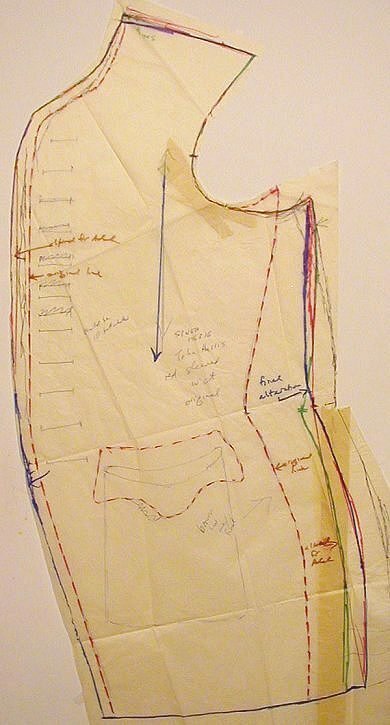 This replicated the original garment's construction, in which the pockets and their flaps were made before the linings went in. Next I assembled the outer shell and the lining, sewing all the long seams on my sewing machine. 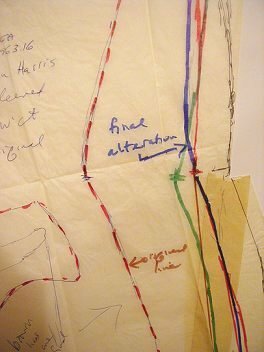 I then turned each seam over and oversewed wherever necessary to ensure that all the interlining edges were caught in each seam, thus taking the strain off the Stitch-Witchery to hold it all in place. I sewed each outer layer seam with a little less seam allowance, and each lining seam with a little extra, so that overall the lining would be a fraction of an inch smaller than the outer layer. To insure accuracy in setting in those tight sleeves, I sewed the armscye seams by hand, in backstitch, and then went over those seams with two rows of machine stitching, for extra strength. Inside and Outside of Center Front stitching. The next step was joining the lining to the outer layer. I pressed under all the raw edges of the necklines and center front edges, using the cooler iron temperature and turning under the lining seam allowances just a little further than the edges of the outer layer. This way, when the lining went inside the outer layer, it was a little smaller and would not show. I was pleased to see how well this worked-- the lining and its fused interfacing nested nicely inside the outer layer and its interfacing. I sewed all the edges by hand, recreating the method by which the lining was inserted in the original. 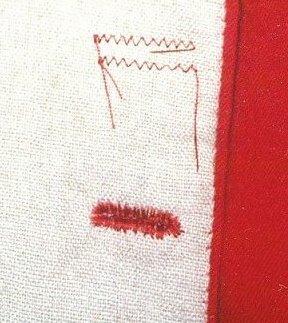 The stitch, called by Diderot "le point a rabbatre sous la main" is well described in Costume Close-Up by Linda Baumgarten et al, p. 8. 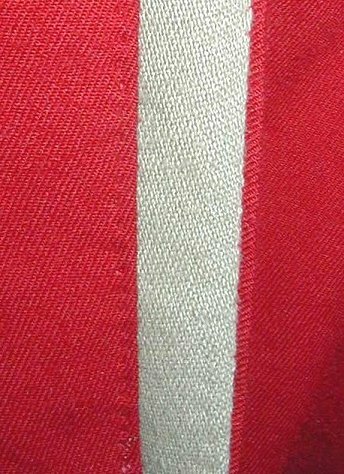 It both hems down the edge of the lining and topstitches the edge of the outer layer, all at the same time, and was a common way to insert linings in 18th century clothing. Having completed the neckline and center front edges in this way, I checked the fit and hang on my daughter, then repeated the process for the sleeve ends and for the coattails of the waistcoat. Some hand-done tacking-stitches hold the outer layer and lining together at the armscyes. Original buttons and button holes. 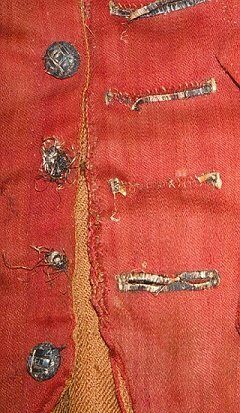 The original garment had 5/8" domed buttons covered in decorative silver wire-wrapped thread, and 2" long buttonholes. 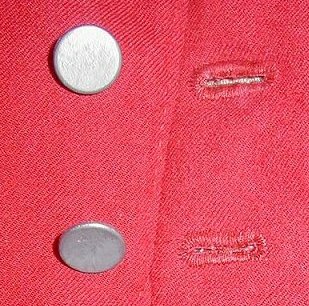 The actual buttonholes were crudely sewn, then the sewing was covered with narrow silver braid. I had already decided not to replicate these decorative elements. I had been able to find no suitable braid with which to recreate the ornamental buttonhole trim, and I already had enough 5/8", fairly thick, pewter buttons to give the general effect of the silver-ornamented ones on the original with no additional expense or effort. Besides, I reasoned, smaller, neater buttonholes and plainer buttons would actually be a better choice for my daughter's purpose, as they would provide less opportunity for an opponent's foil-tip to snag. Working the buttonholes through that many layers required me to machine-baste each buttonhole before I cut it open and hand-sewed it. When I have to do this, I use a small zigzag stitch and leave the thread tails. If I'm careful, I can usually slide the basting out after the buttonhole is worked by carefully pulling on the thread tails. If the basting is worked in the same color thread as the final handwork, I can always clip off close the tails of any basting I couldn't remove and the remainder doesn't show. I worked the buttonholes in silk twist and sewed the buttons on with poly-cotton button thread for strength. It is interesting to note that the finished garment is rather heavy, but no heavier than many originals, which were interfaced with buckram and had other hidden reinforcing layers. 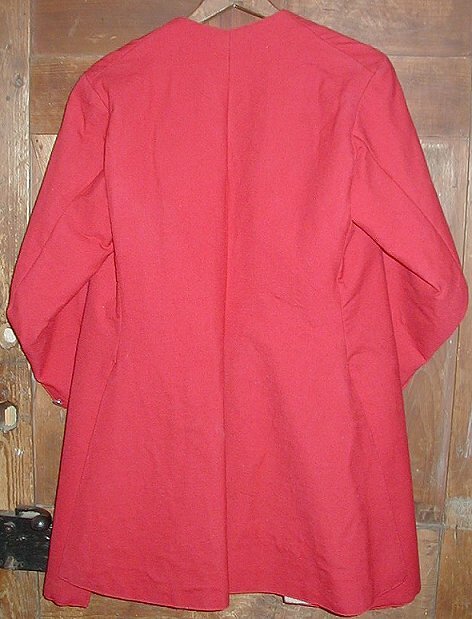 The modern expedient of bonding the muslin interlining to the red worsted twill surprisingly resulted in a final fabric which bears a strong resemblance in texture, drape and weight to a tightly fulled 18th century broadcloth. Were it not for the requirements of making the waistcoat fencing-safe, and adhering to the strict instructions of the fencing master, I would never have replicated an 18th century garment in this way, but the end result serves its intended purpose as protective clothing and still looks gratifyingly like an ordinary period waistcoat. She had it in time to wear for the fencing demonstration at the Daniel Webster Birthplace Militia Muster July 2003, precisely one year after her first foray into reenactment fencing. It was a warm day, but any fencer knows that the protective gear is a necessary evil, even when it's hot. 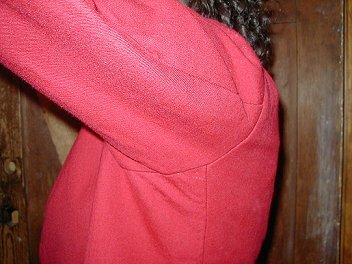 The fused bonding may have made the garment less breathable, but the lining has no fused interfacing on the back and the sleeves, so those parts of the garment could absorb a fair amount of perspiration. She found her 18th century fencing garb comfortable, easy to wear and no impediment to her "technique". She loves the cut and style of the waistcoat so much she wants to wear it to school as a coat! However, I still worry about how well the Stitch-Witchery will hold up over the long haul, so she will be expected to take good care of it, wear it only for the purpose for which it was made, and store it on a good hanger to preserve its shape. Should it ever be necessary, a competent dry-cleaner informed of the hidden details of its construction should be able to clean and press it safely. Hopefully, my daughter will enjoy reenactment-fencing, and this fencing waistcoat, for many years to come.